Analysts from across the globe agree that the United Arab Emirates (UAE) can be expected to continue to dominate the Arab Gulf region's shipping sector, as it keeps investing heavily in its facilities. The reason that it currently dominates the sector and is forecast to in the future, is mainly because of the massive investments the nation has made in it’s port systems in the first place. The new huge Khalifa Port, opened last year, has been nothing short of a big success in it’s first year and is expected to exceed all expectations in the foreseeable future. The award-winning Jebel Ali port has already announced plans to add another terminal in order to stay ahead of it’s competition in the region. Even the smaller ports are reporting record growth numbers in container volume and are forecast to grow to unprecedented levels well into the future. The UAE is perfectly situated geographically to take advantage of the incredible amount of maritime traffic that passes by each day. As the global economy ramps up in the next couple of years, it is expected that the Arab Gulf region will be a major hub and the UAE will be the main beneficiary of it. They already are capitalizing on it, as their giant investments have been paying off on a consistent basis in the last ten years, with the exception of a slowdown after the Financial Crisis began. 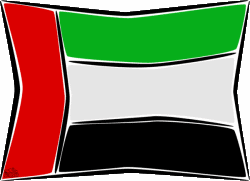 The UAE will be granted official emerging market status in early 2014 and some analysts believe it’s about time. Over the last 40 years, it has gone from an oil-based economy (70% of GDP in 1971) to a more diverse economic base (29% of GDP in 2010). The reason it has grown it’s non-oil sectors so remarkably is because the country had a plan and the money to invest and made the right decisions for the future at the right times. Another staggering statistic is that the UAE’s GDP has increased over 192 times in value over the last four decades and with all their continued investments into maintaining the trend, they are expected to be one of the most stable and influential countries in the new world economy of the future. Ports are the lifeline of any country’s economy. They have to be functional and effective or else the regions economy could suffer, as a result. The leaders in the UAE, both business and government, have certainly recognized their importance of making shipping port and infrastructure investments and spared no expense to build the best state-of-the-art facilities that would give them the best chance to compete and succeed in the future. This is why they are dominating the shipping sector in the region today and will for a long time to come [my opinion].